If you want to capture memorable wildlife photos of your African safari that you'll be happy to show to friends and family, you'll need a telephoto lens to magnify the subject and pull it closer, in the same way you'd use binoculars to enlarge your subject. (See Safari Pictures Selection for examples). In the film era, to get this right you needed a fairly fancy SLR (single lens reflex) camera that allowed you to attach a telephoto lens - for example a 70 to 210mm zoom or, preferably, even something more powerful. But bigger lenses, like 300mm or 400mm telephotos, can be very expensive. Now, thanks to rapid advances in digital camera technology, that's all changed - no longer do you need an SLR body with a selection of costly lenses to capture high quality pictures of wildlife. Today there's a wide range of compact or fixed-lens (also called "point-and-shoot") digital cameras fitted with potent zoom lenses. And here I use the term "compact" to differentiate these cameras from single lens reflex cameras that have interchangeable lenses. Because of the huge zoom range these compacts offer - typically 12x, 20x, and even 35x or more magnification - they're usually quite a lot bigger than the standard, slim compact one associates with the name. For example, the Nikon COOLPIX P510 16.1 MP CMOS Digital Camera has a jaw-dropping 42x zoom, equal to a 1000mm lens at the long end! Now imagine what it would cost to get that sort of lens range if you were using an SLR camera (whether film or digital). Telephoto lenses in the 500mm to 600mm range cost thousands of dollars. Nikon's 600mm f/4.0G Super Telephoto Lens, for example, costs around $9,750.00! In most cases you won't even need such extreme focal lengths when taking safari pictures, although it's always nice to have that extra capability, especially for bird photography . A camera like the Canon SX50 HS 12.1MP Digital Camera is fitted with a 50x Optical Image Stabilized Zoom lens that extends from wide angle to super telephoto (24 - 1200mm equivalent). It's capable of capturing Full HD 1080p video in stereo sound, in addition to great stills, and costs around $430 (at time of writing). With this sort of camera you can take scenic pictures (with the lens set to wide angle), while also being able to zoom in on wildlife that's a loooong distance away. It's also lighter and more compact than a digital SLR camera, 12 megapixels is more than enough to make 10" x 12" or even bigger enlargements, and the price won't break the bank. Bear in the mind the Canon SX50 is one of the more expensive super-zooms, and there are very capable super-zooms available for under $300. While standard compact cameras, usually fitted with something like a 3x zoom lens (about 35-105mm equivalent), are good for all-round travel and holiday pictures, they don't offer sufficient magnification to capture exceptional wildlife photos. Should you be limited to a camera like this on safari, you can still get some excellent shots of larger animals like elephant and giraffe or possibly herds of antelope, zebra, or buffalo. You could even be lucky enough to come across a pride of lions on a kill near to your vehicle. Herd of zebra at waterhole, taken with lens zoomed to 105mm, Hwange National Park, Zimbabwe. Chances are you'll also return home with some great scenic shots that capture the look and feel of the location. In Africa, the best time to visit game reserves is during winter when there's less vegetation so the animals are more visible. You can capitalize on this by emphasing the winter colors, when the grass is a golden brown, leaves have turned yellow and the sky is deep blue – a great recipe for eye-grabbing images that portray the atmosphere and colors of the African savanna. 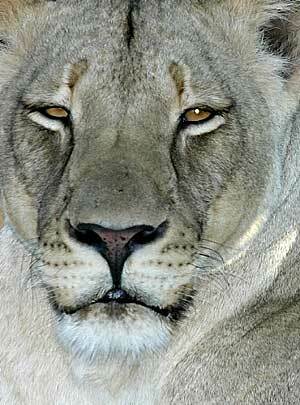 Fact remains though, if you want a frame-filling photo of a sleek lioness staring straight at the camera or a grumpy buffalo giving you the evil eye, you really will need at least a 10X or 12X zoom lens on your digital camera. Set the lens to its maximum focal length - like 420mm - and you’re now able to pull your subject close enough to fill the frame. Don't forget though to vary your shots, using different focal lengths. Try to resist the temptation to take all your pictures at maximum zoom – if you can’t see any background that identifies the location, the picture could have been taken in a zoo. Really tight shots showing just the animal’s head or maybe the markings on its coat. One of the main obstacles to taking really great wildlife pictures with a powerful zoom lens is camera shake. When you magnify the subject, you're also magnifying any camera movement. So unsteady hands (which can easily happen during an exciting safari encounter), or movement from fellow passengers, will cause enough camera shake to result in blurry photos. When choosing a camera, opt for one with an image-stabilized lens, which many super-zooms now offer. This can make a huge difference to the quality of your safari pictures. Use the fastest shutter-speed you can. Where possible, use some form of support, like a beanbag, to keep the camera steady. If you don't have a beanbag and you're in a vehicle, try draping a garment over a half-open window or a seat's backrest and resting the camera on that. If your camera has an optical viewfinder, use that instead of the LCD screen on the back of the camera. You can hold a camera a lot more steady when it’s pressed firmly against your face than when holding it out in front of you, specially at arm’s length. Although the very latest digital SLR cameras are now offering video capability, this is a recent development. Prior to this, one of the advantages of compact or point-and-shoot cameras over digital SLRs for wildlife and safari photography was the ability to shoot video as well as stills. 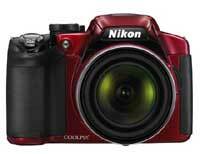 Nikon's COOLPIX P510 and Canon's SX50, along with their huge zoom range, both offer High Definition movie recording. Nevertheless, for professional and serious wildlife photographers, digital SLR cameras will always be the first choice, ahead of the most sophisticated fixed-lens cameras. The reason is simple: quality. Digital SLR cameras have much larger sensors than fixed-lens or compact cameras, so will inevitably produce images of better quality, particularly when the ISO is set to 400 or higher. See Choosing a Camera for Wildlife - The Super-Zoom Option for more on this. Like most things in life, choosing digital cameras is about compromises. For the highest quality digital images, you will need a digital SLR with a minimum of two lenses - but you'll pay accordingly. For the enthusiastic amateur on a budget - or anyone wanting an unforgettable visual record of their safari - you certainly can capture outstanding wildlife pictures with an affordable, easy-to-carry digital "super-zoom" camera. My recommendation is at least a 12x or 18x zoom lens, image-stabilization, 10-megapixels or more and, if possible, an optical viewfinder. Digital camera technology moves so rapidly that it’s simply not possible to recommend specific models. But if you are in the market for an affordable super-zoom digital camera that will work great on safari, you can’t go far wrong sticking to established brands that have a track-record producing this type of camera. * 24 - 1200mm equivalent. * Scores 72% from DP Review. * 42x Zoom NIKKOR ED Glass Lens. * 24 - 1000mm equivalent. * Scores 75% from DP Review. * Scores 80% (Gold) from DP Review. * 30x Optical Zoom Lens. * 27 – 810mm equivalent. * Fujinon 30x Optical Zoom lens. * 24 – 720mm equivalent. * Awarded 4.3 out of 5 stars by Amazon customers. * 40x Ultra Wide-Angle Optical Zoom Lens. * 22.4 - 896mm equivalent. * Awarded 4.5 out of 5 stars from Amazon customers. And remember - digital pictures cost nothing, so don’t be hesitant to shoot lots of photographs, while still keeping basic principles of composition and exposure in mind. Please don't forget to visit our Wildlife Pictures Online Camera Store to check out the many available options and read reviews from real people.